Great flavor at a great price! Really like the Simply Tobacco flavor, it comes really close to a real tobacco taste. I’ve tried many oils. I don’t like flavored oil. Just something close to a cigarette. THIS IS THE CLOSET! I love simply tobacco because it's the closest flavor I've found to the flavor of the marlboro ultra light cigarettes I used to smoke. I've been smoke free for almost 3 years since finding Apollo! Thanks Apollo! Always grab this one for the hubby. I like the fruit flavors but he is bent on sticking with the tobacco ones. He says this one really reminds him of a real cigeratte compared to other tobacco ones he has tried in the past. I really like the flavor of Simply Tobacco E-liquid. In my opinion, it tastes like a cigarette should taste. It's the closest thing to a real cigarette flavor. Does not have sweetness to it and is almost bitter. Very dry tobacco formula indeed which is what I typically prefer. I will say though I think I like the RY4 just a little bit better because I do like the caramel in it. I am thinking about mixing them to see what happens. Does remind of a dry tobacco flavor. I ended up vaping the whole bottle. But I am starting to think that I like the sweet tobacco flavors more so than the regular tobacco flavors. I can see why some people really like this one though! This flavor reminds me of a non filter cigarette. It has a really good tobacco taste to it and is almost like you are vaping the real thing. I was surprised at how much it really reminded me of tobacco! It's super good and it really works the best for me because I don't like the sweet stuff. Always let people try and they are just as surprised as I was. Highly recommend! if you like tobacco you'll love this one. It really tastes like Marlboro! Or at least the closest thing. I prefer sticking to tobacco flavors and Apollo really does make incredible tobacco flavors but this is my favorite because it's the closest to what I had before I started vaping. 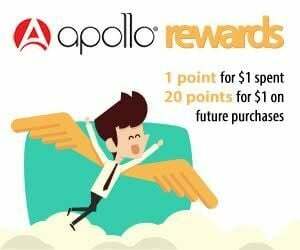 Thanks for helping me quit cigarettes Apollo! I love this flavor!! I have referred several of my friends to your site and they decided to go with it as well, very close to the real taste! It's the closest flavor to actually smoking a cigarette that I've found. Simply tobacco juice feels like perfection for an ex Marlboro smoker!!! Don’t mind the price as this perfectly suits my taste and vaping needs. Just miss having it in 30ml, but we have to thank TPD. Good job Apollo for perfecting such a fine tobacco flavour! This ejuice tastes better then described. It gives a smooth but rich tobacco vape and it’s simply very, very tasty! Nice liquid will buy again. This ejuice is exactly as described, but for some reason I thought of cinnamon rolls when vaping it. Smooth hit and very, very tasty! I kicked smoking almost 4 years ago to the day. I was one of those weirdos who wanted to find E-liquids that would mimic a cigarette, I loved smoking...but needed to kick cigarettes to the curb for health and financial reasons....during my 4 years of looking, I never found one that came close...UNTIL, Simply Tobacco. It has the taste and "feel" of a Marlboro. It fits perfectly into my running menu of e-liquids, and with a cup of coffee, brings back those "good 'ol days" of smoking. Great job! Kudos to Apollo's e-liquid dept., and the mixologists. I'm going to try more of your flavors. Not too bad but I prefer triple nickel and turkish. This has a decent kick but there is something just a tad "not quite right" with the aftertaste. It's decent though, and will probably appeal to smokers, but just not my fave! I got e juice "Simply" taste very smoothly like Marlboro. I like it! 5 stars! !